So the question is, did God keep Mary Magdalene’s apostleship a deep dark secret until 1991, as Hyatt claims? Did the Almighty set up some “deep gnostic knowledge that would stay hidden for thousands of years until Eddie Hyatt came along?” Hyatt would have us believe that God did this very thing. This is what is known as a strawman argument. No one is saying that God does not, has not or will not use women mightily. The verses Eddie highlights however have context he omitted. That says your daughters and female servants will prophesy. That’s it. It does not say that your women shall lead your men, teach your men, or have authority over your men and that beloved is what we are talking about. He should recognize the things I am writing you are a command of the Lord! Yet the forces of Christo-feminism march on with seemingly more and more ridiculous reasons why they think we can ignore God on a subject He has spoken so clearly about. Let us reason again together through the above linked article and see what God really says. 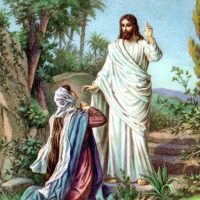 “My mind began to be flooded with thoughts of Mary Magdalene and how Jesus appeared to her first after His resurrection. It was being emphasized to my mind that this was no chance appearance but that He purposely appeared to her first to make a very important statement.